Network Function Virtualization (NFV) Market size is set to exceed USD 70 billion by 2024; according to a new research report by Global Market Insights, Inc. 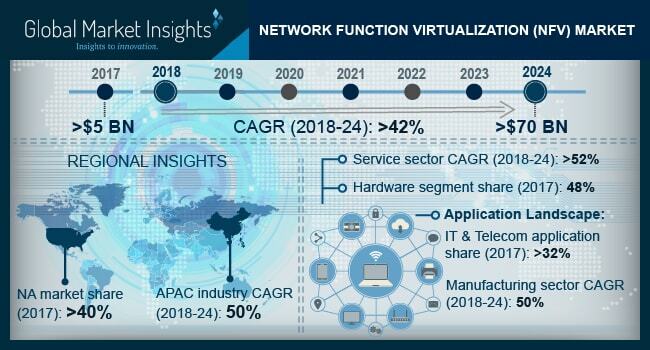 The network function virtualization market growth is attributed to the growing trend of mobility in enterprise IT infrastructures, lower telecom carrier costs enabled by NFV deployment, and consistent industry as well as government initiatives for the commercialization of 5G network technology. As network service providers have invested in multiple technology transitions for mobile, broadband access, and business services over the years, disparate networks with their own proprietary architecture have emerged. This has led to enormous CAPEX and OPEX budget bloats. NFV allows service providers to effectively virtualize network functions such as load balancers, firewalls, subscriber policy management, and mobile RAN (Radio Access Network) functions. Due to the excellent flexibility and agility offered by NFV solutions, enterprises can scale their networking infrastructure in response to increased workloads by using cloud-native NFVs. This flexibility allows them to reduce the cost incurred in procuring additional hardware appliances for supporting newly introduced network services. The hardware segment held a majority share of around 48% in 2017 in the global network function virtualization market due to the large-scale adoption of NFV servers for virtualizing diverse network functions such as firewalls, Network Address Translation (NAT), routing, and Internet Protocol Security (IPSec). As the market evolves, the software segment is expected to lead the market growth due to the extensive deployment of NFV-MANO platforms as well as VNF software applications meant for virtualizing a diverse set of network functions. NFV’s appeal lies in its ability to deliver more network function performance with lesser data center rack space, power, and cooling. This capability is provided by the virtualized architecture of the network framework supported by sophisticated NFV software platforms and applications. Also, NFV software solutions can quickly provision different types of virtual security appliances to enable software-defined security to manage a dynamic threat landscape and protect the network integrity. The manufacturing sector in network function virtualization market is expected to witness the fastest growth while registering a CAGR of around 50% between 2018 and 2024 due to the large-scale implementation of IIoT technology leading to a rapid growth in the number of connected components in the industrial IT environment. In the manufacturing sector, companies are leveraging the latest data center technologies and the best design practices for enabling a better control over supply chains, enhancing productivity through automation and closely managing the manufacturing processes through the use of data processing solutions. Data center functions are being increasingly utilized to consolidate operations and to integrate different manufacturing processes. Data center operations are expected to play a critical role in gathering and managing machine related performance metrics to facilitate the real-time management of operational processes in manufacturing industries. With increasing diversity of connected devices and machine systems, modern networking functions, such as NFV and SDN, will enable a better management of networking functions in large-scale industrial networks in the manufacturing sector over the forecast period. Asia Pacific network function virtualization market is projected to grow with the highest CAGR of around 50% during the forecast period. The increasing adoption of cloud-based computing and storage technology by SMEs in the region, expansion of data center ecosystem in the region by leading global cloud service providers, and large-scale investment in 5G testing and commercialization by telecom carriers in China are some of the major factors influencing the growth of the Asia Pacific NFV market. Companies operating in the global network function virtualization market focus on product development and innovation to develop robust network virtualization platforms along with strategic collaborations and partnerships to leverage their mutual technological capabilities and create innovative service offerings. Major players, such as Huawei, Cisco, Nokia, HPE, and VMware focus, on developing modern network virtualization infrastructure to enable service providers to run network services in a faster and more efficient manner while enabling significant CAPEX and OPEX savings on hardware investment. The cloud service providers provide the building blocks that can be quickly assembled to build a virtual network infrastructure in the cloud. Customers have option to run compute, storage, and database services in the cloud on a pay-as-you-go model to benefit from the scalable architecture. Some of the key players operating in the network function virtualization market are Cisco, Huawei, Ericsson, VMware, Juniper, F5 Networks, Nokia, AT&T, HP, Citrix, NFWare, WindRiver, Riverbed, Broadcom, Oracle, Verizon, 6Wind, Arista, Amdocs, IBM, and Pluribus.